An unconfirmed leak suggests that the iPhone 8 will feature a reflective finish as one of its color options. A trio of standard colors will also be available, but it is unknown which colors they are. New week, new iPhone rumor. The latest comes from well-known leaker Benjamin Geskin, who claims that the upcoming iPhone 8 will have 4 color options. 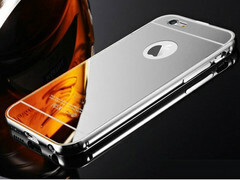 One of those options will be a reflective coating that will give the new iPhone a mirror-like finish. Geskin shared a photo on Twitter, showing an iPhone in a reflective case, that gives an idea of what that might look like. He mentioned the iPhone 8 (calling it the "2017 OLED iPhone") and the purported color selection. Unfortunately, he did not provide any specifics on what those colors are, except that one of them is the mirror-style finish mentioned above. As usual, Apple has not commented on this new piece of info. The leak follows a rumor that emerged last week regarding the company's possible omission of TouchID from its upcoming iPhone, as well as earlier rumors concerning the device's features, which may include wireless charging and a new processor. Thankfully, we won't have to wait long to find out if these rumors are true; barring any delays, the Cupertino-based company is expected to unveil the much-awaited iPhone 8 in two months.